Adam Van Brimmer is a reporter and columnist for the Savannah Morning News. He spent four years covering the Georgia Tech beat and remains fascinated by the Yellow Jackets' history and traditions. He lives along the Georgia coast. Most Yellow Jackets fans have taken in a game or two at Bobby Dodd Stadium, have seen their share of Calvin Johnson highlights, and have heard the story of the school's improbable run to the 1990 national championship. But only real fans know why the team left the Southeastern Conference in 1963, the best place to grab a meal before or after a game, or all the lyrics to "(I'm a) Ramblin' Wreck from Georgia Tech." 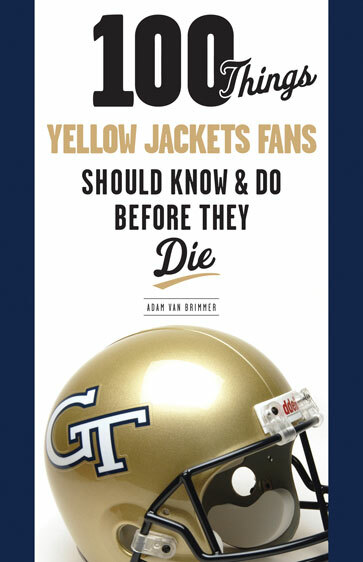 Whether you're a die-hard booster from the days of John Heisman or a new supporter of Paul Johnson, this book contains all of the things Georgia Tech fans should actually see and do in their lifetime. If you bleed white and old gold, then 100 Things Yellow Jackets Fans is for you. It offers the chance to be certain you are knowledgeable about the most important facts about the team, the traditions, and what being a Georgia Tech fan is all about. Adam Van Brimmer is a reporter and columnist for the Savannah Morning News. He spent four years covering the Georgia Tech beat and remains fascinated by the Yellow Jackets' history and traditions to this day. He grew up in Ohio and graduated from Ohio University before abandoning snow and cold weather in favor of a more humane climate. He lives with his wife and two children along the Georgia coast.